A traditional Parisian recipe takes hold in the family household’s bread tin. tea or coffee. Does anybody want one? Here is a lovely weekend recipe to get you busy in the kitchen with family and friends, if you’re like me being washed out by the rain ( with a summer cold) which has hit the UK very badly or just fancy doing a spot of baking. Over the past week the kitchen bread tin has been holding its share amount of the traditional Parisian bread called Brioche, which has been made in Paris since the 17th century. It all started building up since my dear mother was planning to go to a breakfast brunch at work however, since she has been very poorly with Vertigo. The fresh little fingers of yummy brioche filled with two types of the yummy midweek treat or Friday/weekend treat with chocolate chips, or the healthy version filled with raisins has been a temptation within the household. 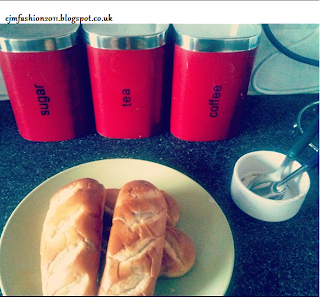 I find brioche so light but delightful with a traditional cuppa during as a snack or even a little treat. If you had the chance to go into the bread tin at the start of the week there was the equivalent to two supermarket packets of brioche ( these were baked freshly ahead of my mothers brunch) , now there is only flavour of raisins. You can get your freshly baked brioche by following this recipe from one of family members BBC Good Food cooking books to your own specification. If you’re within the rainy weather (like I am in UK) this weekend or during your day off etc, it’s a perfect time to bake these yummy savoury/sweet brioche fingers or loaf. This recipe makes two loaves. The prep to make this type of brioche will take about 35-40 minutes, plus the overnight proving and three hours for final dough. Cooking time is 20 minutes. This is suitable for vegetarians. In a mixer or large bowl, mix together the flour, sugar, yeast and salt, then add the milk and 3 of the eggs and continue mixing to make a smooth dough - 5 mins in the mixer or 8 mins by hand. Add the softened butter and mix for a further 5 mins in a mixer or 10 mins by hand. Put the dough in a lightly oiled bowl and leave in the fridge overnight. Your dough will then be stiff and easy to shape. Grease 2 x 500g bread tins, then divide the dough into about 16 pieces and prod some apricots into each piece. Seal them up and shape into little balls. Place the balls in a tin in sequences of 2 until the tin is full. It should take no more than 8 pieces to fill each tin. Leave the brioche for 3 hrs to prove until doubled in size. Heat oven to 200C/fan 180C/gas 6. Brush with 1 beaten egg and bake for 20 mins until golden brown and the loaves sound hollow when tapped underneath. Cool on a wire rack. You can swape the apricots if you don’t like them or you fancy anything other types of fruit in. Along with change the recipe to your own specification… Enjoy!